Many cities in Silicon Valley are working to develop new sources of water to avoid shortfalls in future decades, but East Palo Alto is already at a critical point. The city needs more water in order to spur much-needed economic development and new housing. Here’s how it hopes to get there. Carlos Martinez has big dreams for East Palo Alto. It will continue to be multi-ethnic, there will be residents of all economic classes, affordable housing, schools with 100 percent graduation rates and community programs for youth and seniors. It’s a lot to ask from any town and East Palo Alto has an additional hurdle right now. The city doesn’t have enough water to drive economic growth, which would help provide the tax dollars to fund housing, schools, city services and new development. One key to East Palo Alto’s future is a small triangle of land in the back corner of a Home Depot parking lot. A sunken indent in the lawn is the only indication of the good fortune below. This is the location known as Pad D, where the city has already dug a test well in search of drinkable groundwater. The results were very promising – a good quantity of water and good quality. In less than two years, it’s possible this could be a producing well. And that’s good news because East Palo Alto’s water supply today comes from the San Francisco Public Utilities Commission’s Hetch Hetchy water system. The water itself is not problematic, but the amount is. East Palo Alto currently uses all of its allocation. By 2035, with the city’s projected growth, it will be short 1,200 acre-feet a year (an average household uses between one half and one acre-foot a year and East Palo Alto residents have some of the lowest water use in the state). The situation is not as dire as some Central Valley towns where wells ran dry last year and residents had to haul water for showering and drinking. East Palo Alto residents currently have enough water to meet their basic needs, but without an additional supply the city’s economic growth is hamstrung because new developments are not able to be approved by the city. 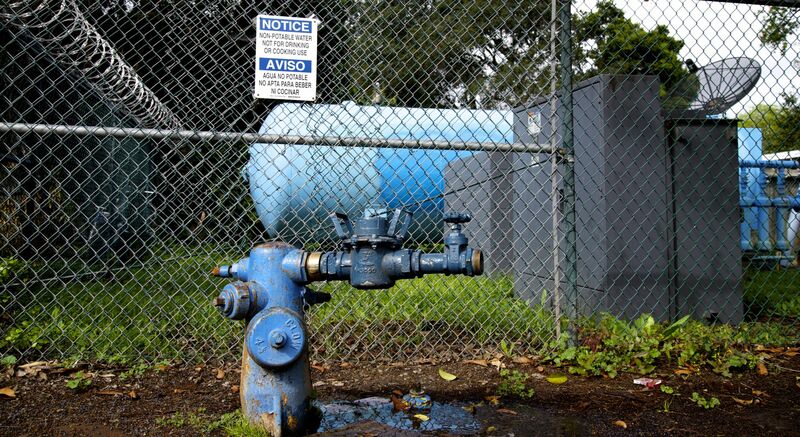 In fact, he says, other nearby cities have allocations that currently exceed their needs, but East Palo Alto officials haven’t yet managed to find cities that are willing to sell or trade their unused water. “There is plenty of water in the system, it’s just not ours,” he said. And without well water or supplies from other cities to increase their allocation, East Palo Alto is out of other options. Even increasing conservation would be hard at this point. Residents have a reported per capita daily water use of 52 gallons – one of the lowest in the area (and the state). When Gov. Jerry Brown ordered statewide conservations mandates of up to 36 percent last year, East Palo Alto was tasked with trimming its water use only 8 percent because it was already low. But residents didn’t just hit the target, they nearly tripled it. By February they had saved enough water to meet an October target. So East Palo Alto is looking to add two new wells to augment Hetch Hetchy water with local groundwater. The first is Pad D and the second well will be located 1.5 miles (2.4km) away on Gloria Way, a residential road. The Gloria Way well was in use decades ago, but residents disliked the color and odor of the water because of high levels of manganese and iron, so a filtration system will be needed before a well here can be used again. Martinez estimates that construction could start on the Gloria Way well at the beginning of 2017. And it won’t be soon enough for some developers hoping to begin construction on projects in East Palo Alto. Martinez says there are three main projects in limbo while the city works on securing new water sources. Two are “Class A” office spaces (the most premiere) – one at 200,000 square feet (19,000 square meters) and the other a whopping 1.4 million square feet (130,000 square meters). The third project is the Primary School, a new school combining education and health services for 500 kids led by Priscilla Chan, the pediatrician and philanthropist wife of Facebook CEO Mark Zuckerberg. The school plans to open in a temporary location this fall until it can complete construction on its permanent East Palo Alto site. All three projects would bring in needed revenue for the city, but East Palo Alto also has other priorities as well. “The city has a site they would like to develop as affordable housing, but of course we can’t develop affordable housing without water,” said Martinez. With more water, East Palo Alto, which is squeezed between the shoulders of Palo Alto (home to Stanford University) and Menlo Park (headquarters of Facebook), may be poised for big changes. In the last decade Martinez says he’s already seen substantial changes. Back in 1992 East Palo Alto held the unenviable title of having the highest homicide rate per capita in the country. These days, though, thanks to the proliferation of the tech boom, it finally has the attention of moneyed interests and large developers. “When the city of East Palo Alto incorporated, many people in San Mateo County thought that the city could not survive because it has a very tiny tax base,” said Martinez. For example, in 1977 total sales tax revenue per capita in East Palo Alto was $8.33. Next door in Palo Alto, it was $64.35 per capita. Up until 1983, East Palo Alto was an unincorporated part of San Mateo County. In the years preceding, neighboring towns and highway construction had chipped away parts of East Palo Alto’s neighborhoods, shrinking the city’s borders down to an irregularly shaped 2.5 square miles (6.5 square km). Community leaders were determined to make East Palo Alto economically sound and do so with a commitment to fair housing. The first step after incorporation, said Martinez, was enacting rent control ordinances. Housing has been a defining factor in the area’s history, long before it was officially incorporated. In the post World War II boom that drove population growth in the peninsula, East Palo Alto became a refuge for African Americans at a time when housing discrimination and “redlining” were common in other nearby cities. For decades East Palo Alto was predominantly African American, but the demographics have shifted in recent years, though it still remains more racially diverse than neighboring towns or the county as a whole. Census numbers from 2010 show the city is 65 percent Hispanic or Latino, 17 percent Black and 7.5 percent Pacific Islander or Hawaiian. The majority of people in the city speak a language other than English at home and 40 percent were born in another country. And as the tech boom has fueled a drastic rise in rents and home prices throughout the area, East Palo Alto remains more affordable, relatively speaking. Neighborhoods tend to have more modest homes and multiunit buildings. Median home prices have risen in East Palo Alto to $650,000, but it’s still a bargain compared to $2 million in neighboring Palo Alto or $1.5 million in Menlo Park. Residents of East Palo Alto, though, have smaller paychecks than their neighbors. Median household income is 43 percent less than the rest of San Mateo County, which makes the need for economic development even greater. But Martinez knows that it will come with trade-offs. It already has. Back in the 1990s, when others counted East Palo Alto as down and out, the city’s leaders made strategic decisions to boost its economy. The downtown area known as Whiskey Gulch “suffered from physically dilapidated buildings, high crime and drug activity, and the proliferation of liquor stores and bars,” the city’s website explains. But it was razed and replaced in 1999 with “University Circle,” which now includes a Four Seasons hotel and office towers. “And that began to bring property tax revenue and stabilize the city,” said Martinez. “People didn’t think retail users would relocate to East Palo Alto.” But they were wrong. Next came another development with Ikea, Home Depot, Nordstrom Rack, Sports Authority, Starbucks and other big chain businesses. That balancing act is something that the city takes seriously as it develops a new general plan for how to grow East Palo Alto as more water becomes available. On the horizon is a new city center that would bring more pedestrian-friendly streets, retail and higher-density housing. The area that Martinez calls the “linchpin” for this new downtown is an empty 6-acre (2.4-hectare) lot surrounded by a chain-link fence. It’s across from the McDonald’s that used to be the city’s biggest tax generator. A sign lists a phone number for the vacant parcel's developer, Barry Swenson. 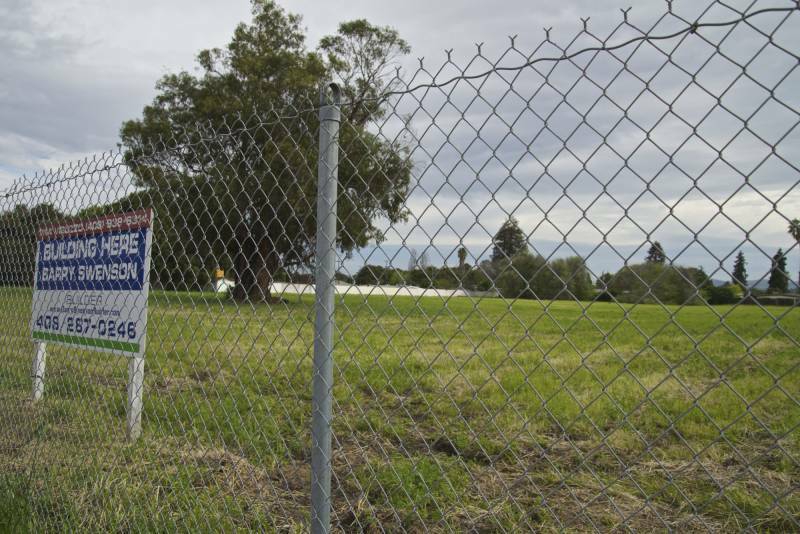 Right now, it is another dream deferred for East Palo Alto. Like other developments, it will have to wait for more water. Martinez hopes the wait is not too long.